"CLOSING. STOP LOSING AND START GETTING PAID." The program features an overarching presentation around the essence of closing. 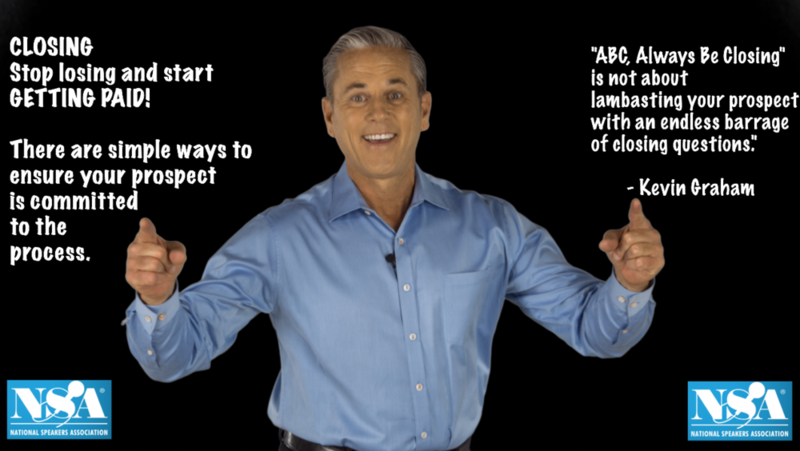 As Kevin Graham says: "ABC, Always Be Closing is NOT about lambasting your prospect with an endless barrage of closing questions. It's about maintaining momentum... momentum toward the close." Improving the close rate of your sellers will dramatically impact your sales performance and sales success. Closing becomes easy if deals are properly qualified, but even shaky deals can be closed often... with the right techniques. This program draws on a seemingly endless list of closing techniques. We do our best to discard tired, worn-out, manipulative practices and only leverage bona-fide, modern methodologies that are proven winners. We strive for win-win negotiations but there's no questions that psychologies of conversation come to play whether your sellers are face-to-face or email-to-email. Regardless of your business model or selling cycles, this program can empower your sellers for sales success by improving their close rates with proven techniques. Your sellers will develop tactical techniques that your prospects and customers will value and find beneficial... as you have to keep in mind, many times your champion and primary contact(s) are doing their best to sell AND close the deal internally. You need to empower these key contacts for sales success, too. The methodologies recommended by Empowered Sales are partnered approaches, such as the use of Close Letters, or Commitment Letters or Sequence of Events email confirmations. By isolating ALL the steps to close, the process is more visible to your sellers, your prospect and to the respective management teams... all making everyone's job easier. Eliminate surprises. Stop deals from bleeding out. Stop kicking the can down the road and pushing close dates out. How many of your currently projected deals-to-close were in last month's or last quarter's projected deals-to-close? If that questions causes discomfort, you'll likely benefit greatly from this program. Sales forecasting will be more realistic as you discover proven techniques for closing deals more often. Your prospects and clients will be relieved from the pressure your current methodologies may be putting them under. Imagine having confidence in your sales projections, because you've gained confidence in your team(s) ability to close deals?